If you’re not lucky enough to be a Florida resident, you will probably fly to Southwest Florida before joining a cruise from Miami. The Port of Miami leads the way as the “Cruise Capital of the World” and it is served by several international airports. We offer helpful tips on the best airports to use when cruising from Miami. More importantly, we provide the definitive guide to the best transportation between Miami cruise port and all the nearby airports. Disclaimer: Some of the links below may earn us a commission if any purchases are completed. Whether you are looking for a cheap airport shuttle service to Miami Cruise Terminal or prefer private transportation, we have all the information to help you make an informed choice. With around 5 million passengers regularly arriving and departing on 55 cruise ships, you can be sure that you will not be alone when heading to the port. You’re going to need cruise luggage tags when traveling to the ship. Shuttle buses, taxis, private transportation and ride-sharing services all provide direct transportation between the Port of Miami and nearby airports. Just scroll down to find your preferred airport in Southwest Florida and search the cruise transportation options before you book. Where is Miami Cruise Port? Miami Cruise Port is located on Dodge Island in the sheltered waters of the Intracoastal Waterway. The port is just 8 miles east of Miami International Airport, within sight of the high-rise architecture of downtown Miami and Miami Beach/South Beach. The address of Miami Cruise Port is: 1015 N. America Way, Miami, Florida 33132. Miami Cruise Port is connected to Miami International Airport by the busy Dolphin Expressway (SR 836), which is a toll road. 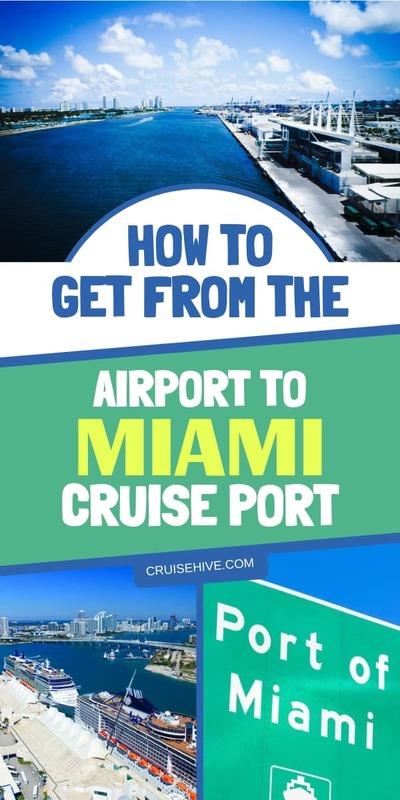 It leads directly from the airport to the Port Miami Tunnel – take the exit marked “Miami Beach/MacArthur Causeway” and then follow signs for Port Miami Tunnel and N. Cruise Blvd. The journey takes about 20 minutes if traffic is flowing well. However, at peak times, it can take double the time! To avoid tolls, from the airport take NW17th St to NW 27th Ave then head east on NW North River Drive. Exit at NW8th St, turn south on Miami Ave then east on NE5th St which becomes Port Blvd. You can then follow signs to your cruise terminal. This journey typically takes at least 30 minutes, and much longer in busy periods. If time is tight, it’s well worth paying the small toll (around $2) to make sure you arrive in plenty of time for your cruise check-in and sailing. Most people taking a cruise from the Port of Miami opt to fly into Miami International Airport (MIA). It is by far the closest and most convenient airport to the Port of Miami. So what are your options for transportation to the cruise port from Miami Airport? The easiest way to book transportation from Miami Airport to your cruise ship is via your cruise line. Many cruise lines provide a shuttle service to and from the airport before and after your cruise. However, these cruise line shuttles only operate on the day of your cruise. They are not suitable if you are planning to fly into Miami a day or so ahead of your cruise (which is recommended to avoid any problems with bad weather or flight cancelations). Cruise line transfers are not free; there is a charge per person. Carnival currently charges $33 per person for the round trip between the airport and the Port of Miami. If you are cruising as a family or group, it can be much more economical to book your own shared transport such as a private taxi, Uber or minibus. Get all your cruise accessories for that dream vacation from Miami. You should be able to book a place on the cruise shuttle bus when booking your cruise, either through your booking agent or directly on the cruise website. If you book your flight with the cruise company, or are on an extended cruise tour, a courtesy shuttle will usually be provided as part of the additional fee. During your cruise, you will be able to book a return shuttle from the port to Miami Airport at the on-board Excursion Desk, if you have not already made arrangements. The advantage of using the cruise shuttle is that the cruise line will take care of everything. You will be grouped together in the lounge, your luggage will be waiting for you in a special area, and you will get priority disembarkation. Once you have booked your seat on the cruise shuttle, you can relax and start looking forward to your cruise! As an alternative to the official cruise line shuttles, there are independent shuttles that offer pre-booked transportation between Miami Airport and the Port of Miami. They tend to be cheaper than cruise lines and use minibuses to transport groups as part of a shared van service. Find the best rates for cheap Miami airport to cruise transport with companies such as GoAirportShuttle, SuperShuttle, and Port of Miami Shuttle. If you are planning to fly into Miami Airport ahead of your cruise and stay a night or two in a hotel, choose a hotel that offers a shuttle pick-up from the airport and/or a shuttle service to the cruise port. Many hotels offer a complimentary shuttle service or charge a nominal fee. Check out the best Miami hotels with cruise shuttle service here. GroundLink offers private transportation between Miami Airport and the Port of Miami cruise terminals. Depending on the size of your party, you can book a private car, van or stretch limousine. Prices start from $71 for an economy vehicle and driver. This price is fixed for up to 3 passengers and their luggage (less than $24 per person each way) making it a very efficient and affordable option for families. It’s a great way to start your Miami cruise in style! SuperShuttle offers shared rides between Miami Airport and Miami Cruise Terminals starting at $16.25 per person return (just over $8 each way). Additional riders are charged around $10 per person. Vehicle upgrades are available along with minibuses and private transfers so you can book exactly the service you need for your Miami Airport to Port transportation. Other companies offering similar shared rides between Miami Airport and the Port of Miami include GoAirportShuttle, Port of Miami Shuttle (best rated) and the Florida Express Bus. For independent transportation between Miami Airport and the Port of Miami, you can use a taxi from the airport without pre-booking. Just head to the taxi rank where a manager will note your destination and put you and your luggage in the next available taxi. You can opt to share a ride (and the price) or opt for a private trip. The advantage of a taxi is that you do not have to pre-book and there are fixed tariffs, so no possibility of overcharging. Currently a taxi ride from Miami Airport to the cruise terminal is $27 flat fee. If you are sharing with other riders it can work out at a very competitive price. However, at the end of the cruise there may be long lines at the terminal waiting for taxis. If you have an imminent flight departure, you are advised to prebook a private taxi to avoid lengthy delays. If you have an Uber or Lyft account, you can request a ride ahead of time. Uber prices start at $13.38 for a shared pool ride, $19.23 for a solo ride and $100 for a Luxury SUV trip one way. Fort Lauderdale Airport (FLL) is a good option for those flying to Southwest Florida as it accommodates many low cost/ no frills airlines. It is 30 miles north of the Port of Miami and the drive takes 45-60 minutes. As detailed above, many cruise lines provide shuttle buses from Fort Lauderdale Airport to the Miami cruise terminal. Book your place via your travel agent or directly with the cruise line. 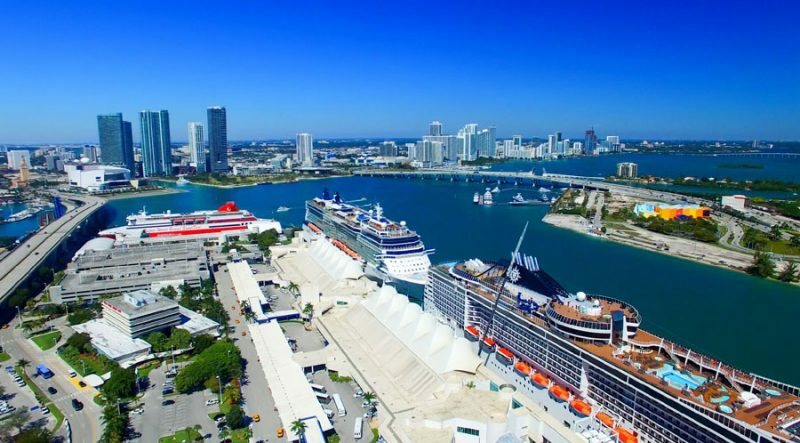 Make sure you specify you are cruising out of the Port of Miami as several cruises also sail from Port Everglades, which is the official name of the cruise port in Fort Lauderdale. Cruise line shuttles charge around $62 per person round-trip for transportation between Fort Lauderdale Airport and Miami Cruise Port. It can be the easiest option for solo cruisers but works out very expensive if you are traveling as a family or group. Several independent shuttles offer pre-booked cruise transportation between Fort Lauderdale Airport and the Port of Miami. These companies tend to be cheaper than official cruise line shuttles. They use minibuses or shared vans to transport individuals as part of a group. It’s worth comparing prices to get the best deal so check out GoAirportShuttle, SuperShuttle, and fgcarservices to find the best rates. Fort Lauderdale has plenty of hotels but they only provide shuttle services to Port Everglades Cruise Terminal in Fort Lauderdale. If you choose to fly into Fort Lauderdale and stay in a hotel nearby, you will need to arrange private transportation from Fort Lauderdale to the Port of Miami. GroundLink offers private transportation between Fort Lauderdale Airport and the Port of Miami using private sedans, vans or a limousine to suit your requirements. Prices start at $106 for an economy vehicle and driver. This price is fixed for up to 3 passengers and their luggage, which works out at around $35 per person each way. SuperShuttle offers a shared ride service for cruisers between Fort Lauderdale Airport and the Port of Miami. Prices start at $42.85 for a shared ride, and up to $131 for a premium executive non-stop service. Other companies offering similar shared rides between Fort Lauderdale Airport and the Port of Miami include fgcarservices and Florida Express Bus. For independent transportation between Fort Lauderdale Airport and the Port of Miami, you can use a taxi from the airport without pre-booking. Just head to the taxi rank where a manager will note your destination and allocate you and your luggage to the next available taxi. You can opt to share a ride (and the price) or choose for a private trip. Taxis are at least $72 each way. If you have an Uber or Lyft account. you can book transportation ahead of time. Uber prices start at $32.13 for a shared pool ride and up to $179 for a Luxury SUV trip one way from Fort Lauderdale Airport to the Port of Miami. Spending a few days in Orlando makes good sense, either pre or post-cruise. Fly into Orlando International Airport (ORL) and rent a car to get you around the theme parks and attractions. You can then drive down to the Port of Miami for your cruise. The drive is around 230 miles via the I-95 or the quieter Florida Turnpike (tolls). Drop off your rental car at a prearranged car rental depot near the Port of Miami. Most car rental companies provide a free shuttle transfer to the Port of Miami as part of the service. Another airport within easy reach of the Port of Miami is Palm Beach International Airport (PBI). This smaller airport is 71 miles north of Miami. The drive south down the I-95 takes at least 75 minutes on a good day. Best options are Uber or self-drive car rental. As you can see, it can save you money in the long run if you fly into Miami International Airport. Transfers to the Port of Miami are speedy and cheap compared to other airports so it’s worth considering all the options before booking your flight. We wish you plain sailing and sunny skies whichever option you choose for your airport transportation to Miami Port!